Most dermatological issues that make their way to veterinary offices present when the pet’s incessant itching spurs the owner into action. According to veterinary dermatologists, about 25 percent of general practices’ cases are skin-based and 10 percent of those cases are allergy-related. Sunburn on the muzzle and around the eyes. Itchy dogs and cats referred to specialists’ care tend to be lifelong derm patients and are controlled rather than cured, but general practitioners’ clients pressed by the economy want the issue handled in a fast, financially feasible way without the added cost of prolonged specialty care. While some dermatology cases take diligence that comes with a price tag, manufacturers provide a plethora of treatments that can prevent skin maladies and treat existing ones cost effectively. 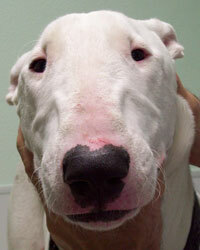 Bull terrier with a sunburned face. Itching caused by parasites can be almost completely eliminated, making preventive care an essential educational piece at every patient visit and mailed reminder. Bull terrier with a sunburned belly. Specialists advise curbing the diagnosis time by taking a skin scrape, ear swab and impression smear at the first sign of itchiness. If parasites can be eliminated, treat any existing secondary infection. 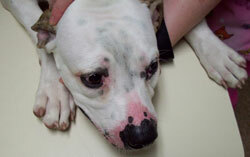 If the animal has no or partial response to treatment at the recheck, an allergic skin disease could be the cause. While atopic dermatitis accounts for 90 percent of the unresponsive cases, only 10 percent are the result of a food allergy. “Treating the secondary infection with oral and topical medication makes pets more comfortable and helps uncover the underlying issue,” says Rusty Muse, DVM, Dipl. ACVD, an executive board member of the American College of Veterinary Dermatology. Dr. Muse practices at the Animal Dermatology Clinic in Tustin, Calif.
A veterinarian might want to use a crossover product that will help the patient when itching is caused by any number of causes, says Steven Melman, VMD, founder of DermaPet of Potomac, Md. “Veterinarians may want to lean toward natural products as much as possible to treat skin that’s already irritated,” Dr. Melman says. Most veterinary clients don’t realize that veterinary dermatologists are also otology experts. Owners of Cavalier King Charles spaniels may be most educated on that front. Dr. Cole is conducting a clinical study of 74 Cavalier King Charles spaniels to test the use of a mucolytic drug that could prevent recurrence of middle ear infections in the breed. Currently, the treatment consists of making an incision in the pars tensa, draining and flushing, but the condition tends to recur. “We think the disease is caused by a dysfunction of the Eustachian tube prohibiting normal draining from occurring,” Cole says. Nancy Bathurst, VMD, clinical development manager of Virbac Animal Health in Fort Worth, Texas, says investigating the functions that lead to skin conditions such as allergies and hot spots is a developing science. The product will be produced in a pipette for use in dogs and can be applied in the general area of irritation or directly to lesions. It also can be used as preventive care or treatment. Other manufacturers are improving dermatological preventions for pets. Epi-Pet’s sunscreen is the only pet sunscreen with Food and Drug Administration compliance. Epi-Pet Sun Protector Sunscreen is a mist sprayed on fur when the animal is in the sun. The Animal Medical Center is conducting clinical trials that document the sun’s effects on pet skin. Dr. Torres, at the University of Minnesota, is working on the canine atopic dermatitis-relation to epidermal antimicrobial gene expression. The $77,349 research project began in 2008 and is sponsored by Morris Animal Foundation. She expects to have presentable results in 2010.